^ The Paramours. Tsimon.com. [2013-03-27]. ^ 吉利兰, 约翰. Show 52 – The Soul Reformation: Phase three, soul music at the summit. [Part 8]: UNT Digital Library (audio). Pop Chronicles（英语：Pop Chronicles）. Digital.library.unt.edu. 1969. ^ The Righteous Brothers. Rock and Roll Hall of Fame. [2019-01-02]. ^ Leach, Robin. 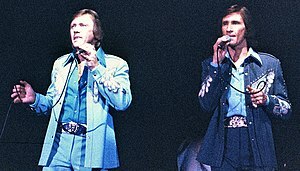 The Righteous Brothers reborn: Bill Medley's emotional Harrah's residency. Las Vegas Sun. March 23, 2016. ^ 5.0 5.1 The Righteous Brothers: Awards. ^ The Righteous Brothers. RPM Weekly. ^ The Righteous Brothers – Right Now!. Discogs. ^ The Righteous Brothers – Some Blue-Eyed Soul. Discogs. ^ The Righteous Brothers: You've Lost That Lovin' Feelin'. AllMusic. ^ The Righteous Brothers: 'This Is New!. AllMusic. ^ The Righteous Brothers: Just Once In My Life.... AllMusic. ^ The Righteous Brothers: Back to Back. AllMusic. ^ The Righteous Brothers: Soul & Inspiration. Discogs. ^ The Righteous Brothers: Go Ahead and Cry. AllMusic. ^ The Righteous Brothers: Sayin' Somethin'. AllMusic. ^ The Righteous Brothers: Souled Out. Discogs. ^ The Righteous Brothers: Souled Out. AllMusic. ^ The Righteous Brothers: Re-Birth. Discogs. ^ The Righteous Brothers: Give It to the People. AllMusic. ^ The Righteous Brothers: Sons of Mrs Righteous. AllMusic. ^ The Righteous Brothers. cdbaby. ^ The Righteous Brothers Album & Song Chart History: "Billboard 200". Billboard. Nielsen Business Media, Inc.
^ Top Catalog albums. Billboard. Nielsen Business Media, Inc.
^ The Righteous Brothers. Official Charts Company. ^ The Righteous Brothers. Dutchchart. ^ The Righteous Brothers – The Righteous Brothers Greatest Hits. Discogs. ^ The Righteous Brothers – Greatest Hits. Discogs. ^ 31.0 31.1 Canadian album certifications – Righteous Brothers – Righteous Brothers. Music Canada. ^ The Righteous Brothers: Anthology 1962–1974. Allmusic. ^ Unchained Melody – Best Of Righteous Brothers. Amazon. ^ Unchained Melody: Very Best Of The Righteous Brothers. Amazon.